WASHINGTON — House Democrats have mostly shunned talk about pursuing impeachment of President Trump since Sunday's release of the summary of special counsel Robert Mueller's report revealed that the investigation found no criminal collusion between the president's campaign and Russia. Democratic leaders in Congress say impeachment is not something they are currently thinking about as they increase demands that the full Mueller report be made public, not just the four-page summary released by Attorney General William Barr. But at least one member is pushing forward. Rep. Rashida Tlaib, D-Mich., who has been one of the fiercest advocates for impeachment, is currently circulating a letter among her colleagues to support a resolution that would instruct the House Judiciary Committee to investigate whether the president "committed impeachable offenses." "I, firmly, believe that the House Committee on Judiciary should seek out whether President Trump has committed 'High crimes and Misdemeanors' as designated by the U.S. Constitution and if the facts support those findings, that Congress begin impeachment proceedings," Tlaib writes in the letter, which was obtained by NBC News. Tlaib says the committee should investigate matters outside of what Mueller looked into, including questions about whether Trump violated the Foreign Emoluments Clause, whether he "committed crimes to defraud the United States" by directing Michael Cohen "to make payments to interfere and affect" the 2016 election, and whether there is evidence that Trump obstructed Mueller's investigation — a charge that the special counsel did not make a judgement on, according to the Barr summary. While Tlaib is asking for the matters to be looked at as impeachable offenses, House committees are already investigating those issues. Judiciary Committee Chairman Jerry Nadler, D-N.Y., has announced that his committee was launching a sweeping probe, explicitly identifying potential violations of the emoluments clause and obstruction of justice as two key areas of focus. The Oversight Committee, on which Tlaib serves, has taken the lead in probing the hush-money payments. Nadler's committee has also requested documents from some of the key players involved, including Cohen. Tlaib briefly spoke about her letter at a Tuesday morning closed-door meeting with her Democratic colleagues, but there was no apparent enthusiasm for it, according to two people in the room. The letter asks members to reply by noon on Wednesday if they'd like to sign on. It's unclear at this point if anyone has, but it appears that support seems to be minimal from Democratic leadership and even some of Tlaib's allies. Rep. Alexandria Ocasio-Cortez, D-N.Y., said that she supports impeachment "in principle," but didn't say whether she was ready to sign onto Tlaib's proposal. "We're taking a look at it. Members have to pursue what they see is right and what their district wants," Ocasio-Cortez said. Impeachment has been a dicey topic for Democrats since they regained control of the House of Representatives in the 2018 midterm elections. Some newly-elected members have been outspoken about the issue while leadership has attempted to tamp down on it, knowing that it could be politically destructive for Democrats if impeachment is an overtly partisan issue. House Speaker Nancy Pelosi told the Washington Post earlier this month that the president "is not worth it." On Tuesday, she said that "impeachment's not on the table until it is on the table." She said that she her message to her members is that it is most important to ensure that the attorney general releases Mueller's full report. "Let us see this report. I have great respect for special counsel Mueller, but let us see the report," she said. "We don't need an interpretation by an attorney general who is appointed for a particular job, to make sure the president is above the law. We need to see the report." 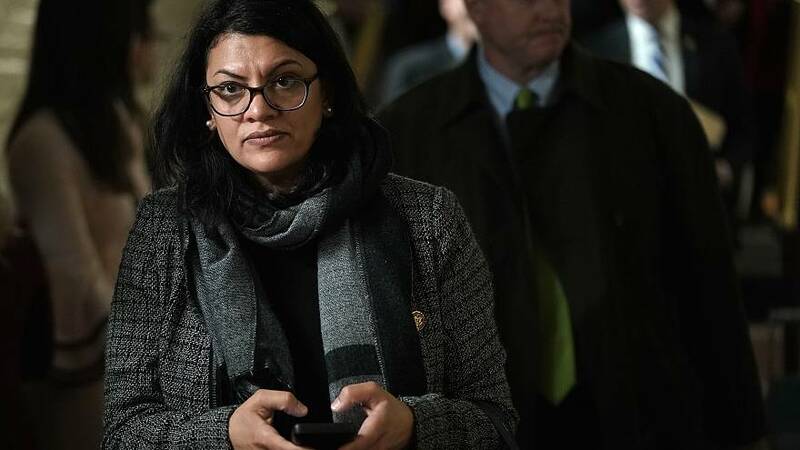 Tlaib has been one of the most outspoken members in favor of impeachment. She came under fire for telling a progressive crowd in her first week on the Hill that Democrats would "impeach the mother f***er." Most Democrats, however, appear to be in agreement with Pelosi on the issue, hoping to refocus their efforts on their policy agenda. Rep. Debbie Dingell, D-Mich., was asked by Tlaib to sign the letter, but declined. "This county is divided," Dingell said. "I'm going to focus on pre-existing conditions, lowering health care costs, trade."